Ar·a·bic [árr?bik] noun Semitic language: a Semitic language that is the official language of several countries of North Africa and Southwest Asia. 150 million.175 million. adjective 1. of Arabia: relating to Arabia, or its peoples, language, or cultures 2. of Arabic: relating or belonging to the language Arabic See Arab. Arabic Much of English is made up of words from other languages, and Arabic is an important contributor in this respect. It has, for example, contributed a word to U.S. regional English: alforja, used in the Southwest to mean “saddlebag,” the same meaning held by its Arabic ancestor. First recorded in the early 17th century, alforja migrated into U.S. dialect from Arabic al-?urj “the saddlebag,” via Spanish. Arabic is also the ultimate source, via American Spanish, of alfilaria, also called “pin clover” and “pin grass,” a forage grass grown in the Southwest. First recorded in the late 19th century, it is an alteration of American Spanish alfilerillo, a diminutive of Spanish alfiler “pin,” from Arabic al-khil?l “the thorn, the pin.” Moreover, Arabic is an intermediate, direct, or ultimate ancestor of many other English words opening with al-, where the definite article in Arabic becomes a formative element in English and in other languages, for example, Spanish, Portuguese, Latin, French, and Italian, through which many Arabic words transited into English. Among these borrowings are, for example, albatross (ultimately from Arabic al-?a?? ?s “the diver”), alcaide (“the commander”), alcazar (“the castle”), alchemy, alcohol, alcove, alembic, alfalfa (“the best kind of fodder”), algarroba, algebra, alkali, and alguacil or alguazil, a law enforcement officer in Latin American regions under Spanish influence (ultimately from al-waz?r “the vizier”). Arabic is also the direct or ultimate source of some very common English words, for example, ghoul, sash (from Arabic ? “muslin”), candy (via French), cotton (via French), lemon (via French), lime (via French and Spanish), giraffe (via French or Italian, both words from Arabic zar?fa), magazine (via French and Italian), and zero (via French and Italian, ultimately from Arabic ?ifr “emptiness,” the source of English cipher). Another émigré with an interesting history is mohair. Going back in English to the late 16th century, it was respelled from mocayre because English speakers, unfamiliar with -ayre, likened it to hair, a familiar English form, which they substituted for -ayre, in a process called “folk etymology.” Mocayre is ultimately from Arabic mu?ayyar “cloth of goat’s hair,” literally “select, choice,” the past participle of the Arabic verb ?ayyara “prefer.” Arabic has also been an intermediate transport medium in migrations of words from other languages into English. For instance, sugar, first recorded in English in the 13th century, came into English via an early form of French sucre, which itself came via medieval Latin from Arabic sukkar, and finally from Sanskrit ?arkar? “grit, ground sugar.” Elixir entered English in the 14th century via medieval Latin from Arabic al-iksir, from Greek x?rion “dry powder for treating wounds,” from x?ros “dry.” Arabic occasionally combines with English to yield compound words, for example, seif dune, first recorded in English in the early 20th century, denoting an enormous desert dune formed in parallel ridges, seif coming from Arabic sayf “sword.” Some Arabic borrowings have taken on English affixes: jihadist, Islamism, and Islamize are examples. 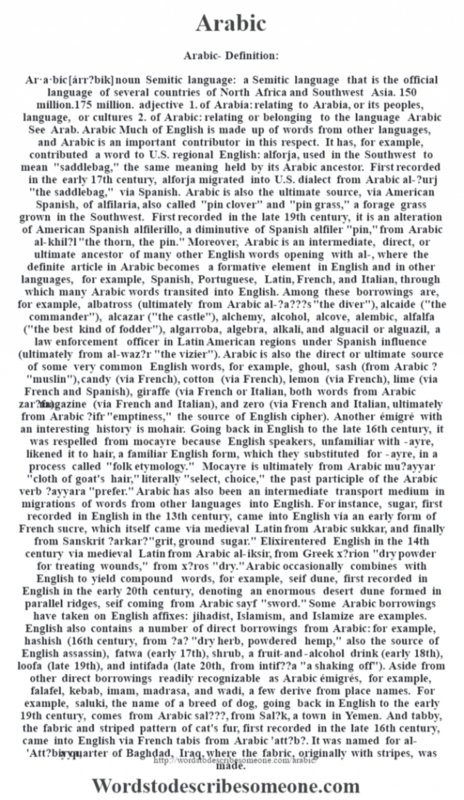 English also contains a number of direct borrowings from Arabic: for example, hashish (16th century, from ?a? “dry herb, powdered hemp,” also the source of English assassin), fatwa (early 17th), shrub, a fruit-and-alcohol drink (early 18th), loofa (late 19th), and intifada (late 20th, from intif? ?a “a shaking off”). Aside from other direct borrowings readily recognizable as Arabic émigrés, for example, falafel, kebab, imam, madrasa, and wadi, a few derive from place names. For example, saluki, the name of a breed of dog, going back in English to the early 19th century, comes from Arabic sal?? ?, from Sal?k, a town in Yemen. And tabby, the fabric and striped pattern of cat’s fur, first recorded in the late 16th century, came into English via French tabis from Arabic ‘att?b?. It was named for al-‘Att?biyya, a quarter of Baghdad, Iraq, where the fabric, originally with stripes, was made.